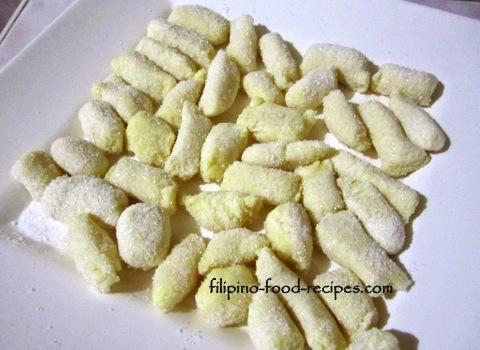 Pastillas de leche is one of the most popular staple sweets of the province of Bulacan, it is quite tedious to make but well worth all the work. This delectable milk candy is popular because of its creamy goodness and will sure bring a smile to the whole family. This candy making requires time and effort because you have to basically cook to evaporate milk liquids to make it thick but the job is well worth it once you taste it. Wrapped rolled in plain white bond paper and white Japanese paper(or gift wrap tissue paper), they are usually sold a little pricey for a small piece. You certainly can never have enough, so if you have the time and patience, why not make yourself for the family. Use a Teflon cooking pan if available so there is no waste and you get every bit of the candy without wasting the bits stuck on the bottom of the pan. Also, you may also vary the flavors by adding chocolate, ube, mango, etc. according to your preference. 1 Mix the fresh or whole milk and sugar in a sauce pan and boil on medium heat, stirring continuously until thick. 2 Turn the heat off and add butter and powdered milk, refrigerate. 3 Portion in 2 tablespoons measure and form into a log. 4 Cut in half inch lengths and roll in sugar. 5 Wrap the pieces in colored cellophane, or do the traditional white bond paper roll, and gift wrap tissue.